Image caption The Russian and Turkish leaders have spoken for the first time in more than six months. The leaders of Turkey and Russia have spoken for the first time since the downing of a Russian military jet by Turkey sparked a diplomatic crisis. 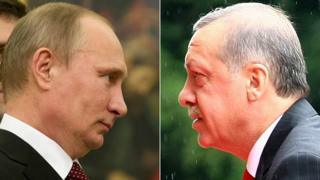 Recep Tayyip Erdogan and Vladimir Putin agreed over the phone to meet in person, Mr Erdogan's office said. The call came after Turkey expressed "regret" earlier this week to Mr Putin and to the family of the Russian pilot killed in the incident. The fighter jet was shot down near the Syria-Turkey border in November. Turkey claimed that the jet was warned repeatedly after entering Turkish airspace, a claim fiercely denied by Russian officials. In the call, Mr Putin also called an attack on Istanbul's Ataturk on Tuesday "heinous". A spokesman for Mr Erdogan said on Wednesday that "necessary steps" would now be taken to mend the damaged ties between the two countries, and to drop restrictive measures on Russians visiting Turkey. "Reiterating their commitment to reinvigorate bilateral relations and fight terrorism together, the two leaders agreed to remain in contact and meet in person," he said. Turkey angered Moscow in the aftermath of the incident by failing to apologise, despite demands from Russian officials. Mr Putin said he had been stabbed in the back and accused Mr Erdogan of collaborating with so-called Islamic State. Russia responding by hitting Turkey with a raft of sanctions, banning import of Turkish foodstuffs and stopping Russian package holidays to Turkey. The Russian Su-24, an all-weather attack aircraft, was flying in skies above the Turkey-Syria border area on 24 November when it was shot down by Turkish F-16s. The plane crashed in the mountainous Jabal Turkmen area of the Syrian province of Latakia, killing the pilot. A Russian marine involved in a helicopter rescue attempt was killed when the helicopter came under fire from local fighters. The navigator in the jet, Capt Konstantin Murakhtin, survived the crash and was taken to Russia's Hmeimim airbase in Latakia by Syrian government forces. Turkey said planes were warned 10 times during five minutes via an "emergency" channel and asked to change direction. The Russian defence ministry insisted that the aircraft remained within Syria's borders throughout its mission and did not violate Turkish airspace and received no warnings. Can Russia and Turkey heal rift?